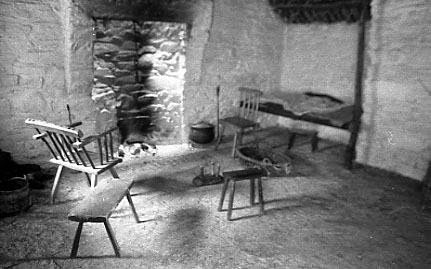 There’s an interesting article on the Old European Culture blog about alcoves found in old houses in parts of Ireland. The alcoves, built next to the warm hearth, were apparently called cailleach, which of course reminds us of the name of the old veiled one, the goddess. Whether this is coincidence or not, it reminds me of the little house in Scotland made to keep the Cailleach and her family warm through the winter, and I imagine a time when each house would have a place for the Cailleach near to the fire. Nan Shepherd was a Scottish writer and hill-walker, who described her experience of the Cairngorms as a kind of meditative participation in the landscape. The BBC TV Documentary, in the Secret Knowledge Series is called The Living Mountain: A Cairngorms Journey and there is an interesting article about the documentary and Nan on the BBC News website here. On the top of Slieve da En facing towards the town of Sligo and situated between two of the mountain peaks, is a lake called Loch Ghedh. This lake has the reputation of being the deepest lake in the world. It was supposed by the old people to be enchanted and the devil’s mother was said to be drowned in it. There is a legend told of it and it was of a man who went out this mountain one fine day cutting rods or sticks with a bell hook. When evening came the man did not return to his home. Of course a big search was made to find the missing man. The search proved in vain and the people formed the opinion that in returning to his home in the evening with the bundle of sticks on his back, the man in passing by Loch Ghedh slipped off the slopes on the side of it and fell in and was drowned. This man had a daughter in America and in some years after this sad happening she decided to come home to her native Sligo and help to console her people on their great loss. When coming in on the boat to Sligo bay she observed in the sea a bundle of rods and at once recognised her father’s bell-hook stuck in them. The old people say that the lake is connected with the sea by an underground passage and that this accounted for the bundle of rods being found in the Ocean. As discussed in my previous post, Clooth-na-Bare was a corrupted form of Cailleach Bhéara – the old woman of Beare, an important figure in Irish and Scottish folklore. Presumably it is she who is being described as the devil’s mother in this story. Under Sliabh Dá Éan (‘mountain of two birds) lies a small but beautiful hidden lake. Legend has it that got its name Lough Dhá Géanna from the story of king Sweeney. Sweeny was a king condemned by an angry cleric to wander, naked and nervous as a bird throughout Ireland. Any sharp sound, like the ringing of a bell, would send Sweeney into madness. Because of the curse he began to levitate and move about like a bird. Being bird-like he could never trust humans but fled from place to place, naked and hungry. Near Lough Gill, in the eastern Ox mountains, Sweeney fought with a Cailleach, a wise woman, and both of them in their struggle transformed into geese and dived into the lake. Never to be seen again. The shine is known as Tigh na Cailliche, ‘The Hag’s House’ or the house of the goddess, or alternatively – on the map – as Tigh nam Bodach, the old man’s house. Earlier this year a friend and I were inspired by a post from William A. Young’s blog Feral Words to make a pilgrimage to the house, and this is the story of that visit. William had visited the shrine during the winter, when snow was on the ground. He and his companion took a challenging route up to the glen from Bridge of Orchy, camping out overnight. When he arrived he found that the stones representing the old woman and her family were snugly tucked away inside the little house, for that is the ritual of the place: every year at Samhain the family of stones is moved inside the house for the winter months, and then at Beltane they are taken out again, to sit in front of the little stone house. I’m not too good at long walks, so I looked for an easier path to the shrine, and found one mentioned here, accessible by car and then by foot along the shore of Loch Lyon. I was also hoping that going in mid-summer would make things easier. It did, but the journey still took me near to the limits of my strength! On this kind of magical trip, signs and omens become important. Everything seen and done becomes part of an unspoken dialogue with the shining ones. The afternoon before our walk we stayed near Loch Tay, and went for a stroll in the warm summer sunshine, looking for some cup-marked rocks that were shown on the map. As we wandered around a field, an white-bearded sheep farmer came by on a quad bike, his collie sitting on the back. I asked him about the cup-marked rocks, but he wasn’t sure where they might be. We talked more. He spoke quietly and thought a long time about each thing he said. I felt myself slow down. It was like he was full of the countryside and the light. “I was born in the Western Isles,” he said, “but my wife is from here.” Somehow this encounter stayed with me, and cheered me on our walk. I felt I had been checked out by ‘the old man’. During the night the fine weather broke and we were woken by thunder and lightning. In the morning it was still raining, but we had waterproofs and after some hesitation we decided it was now or never. Driving over the mountain pass from Loch Tay into Glen Lyon, we were surrounded by mist and low clouds as the rain fell, with lightning flickering above us. After splashing twenty miles along single-track roads, we finally arrived at the start of our walk by the hydroelectric dam at the east end of Loch Lyon. As we began to walk the weather relented, and although the clouds continued to lour over the hills, the weather remained dry as we walked by the dam and followed the track alongside Loch Lyon. During the walk we were reminded that nothing worthwhile is achieved without difficulty. In so many stories the heroes and heroines must perform tasks and overcome obstacles in order to reach their goal. It felt like the morning’s rain had been an obstacle like this, and we encountered others. For example, the map optimistically described the crossing of Allt Meurain as a ‘ford’, but it turned out to be quite deep. We ended up wading knee-deep through rapidly flowing water. The pain of walking barefoot on the sometimes sharp stones in the rocky riverbed had to be endured, for the body’s natural reaction of aversion risked falling headlong into the icy water. Luckily we did not see the Washer at the Ford, which I took as a good sign! After the ‘ford’ we began walking up Glen Cailliche, the valley of the Cailleach, and just when I was beginning to despair of finding it, we came in sight of the Tigh nam Bodach, down below the track on the northern side of the river. There were more than just three stones sitting outside – all with the same characteristic rounded river-worn shape. As you can see in the picture below there was one big one with a clearly defined head. Behind it was a dumpy, almost acorn-shaped stone. To the left were two smaller stones with defined heads, lying on their sides. To the front there were three other quite small stones which seemed part of the pattern. In Twilight of the Celtic Gods  it says that there is a local legend that every hundred years or so, the Cailleach gives birth to another stone, and “though the baby of the family is still very small, people swear it is growing and will one day be just as big as the others”. “Many years ago, in a fierce snowstorm, an unnaturally large man and woman were seen coming down the mountain-side of the upper glen. They asked the people who were still settled there, for hospitality and shelter. These were willingly given to them. This pleased the supernatural pair well and they took up residence in the glen when the inhabitants had built a thatched house large enough to accommodate them. The woman was pregnant and in due course gave birth to a daughter. The weather was always favourable when they dwelt there. The stock flourished and the crops were always of the best. The feeling of the shrine seemed to me very pleasant and warm. I had half expected a rather more fierce encounter with the Cailleach, but if I had to put my feelings into words, I would say that I found her a mother, one who can comfort and provide strength in need. I suspect though that she needs to be approached properly. After a while resting at the shrine, the mist began to descend down the Glen and we began our walk back to the dam.